How many opened this post simply because they couldn’t believe it takes 25 steps to make applesauce? 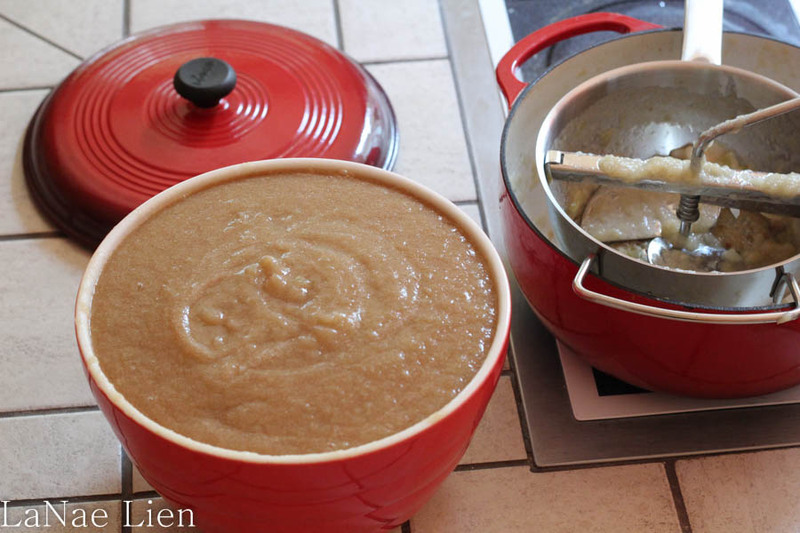 However, a great many people don’t make applesauce because they think it’s too much work. And it can be too much work. 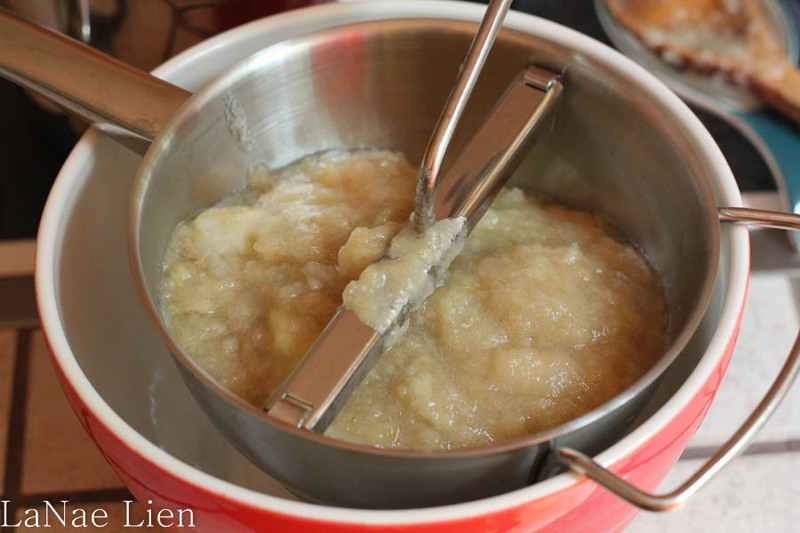 But, if you invest in a few inexpensive tools you’ll be making applesauce like a pro in no time. An apple peeler/corer. I first saw these gadgets at the Oregon State Fair when I was a kid. My dad bought one. I acquired one a few years ago from Target or Fred Meyer, don’t remember which. With this nifty gadget you shove the whole apple on a prong and it runs it along a blade that peels it and simultaneously through a round metal blade to core it. I only use the peeler part. I find that the corer part only works on perfectly symmetrical apples. You now have a whole peeled apple. The next thing you need is a simple corer. 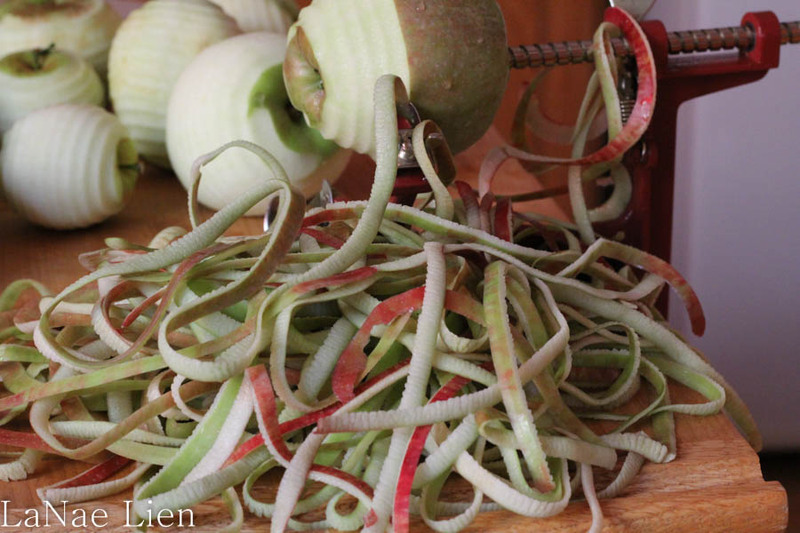 Now, even a corer can perform less-than-perfectly with misshapen apples. It is what it is. A world of misshapen apples. This is where your third essential will help you out. A food mill. A thing of beauty. The food mill is why it’s okay if the apples have a little extra peel on them or a little core (though I do trim large sections of core before cooking). Once the apples are cooked down you just run them through the food mill at your desired setting and you have perfectly smooth sauce. If you prefer chunky sauce use a potato masher and mush the apples by hand. 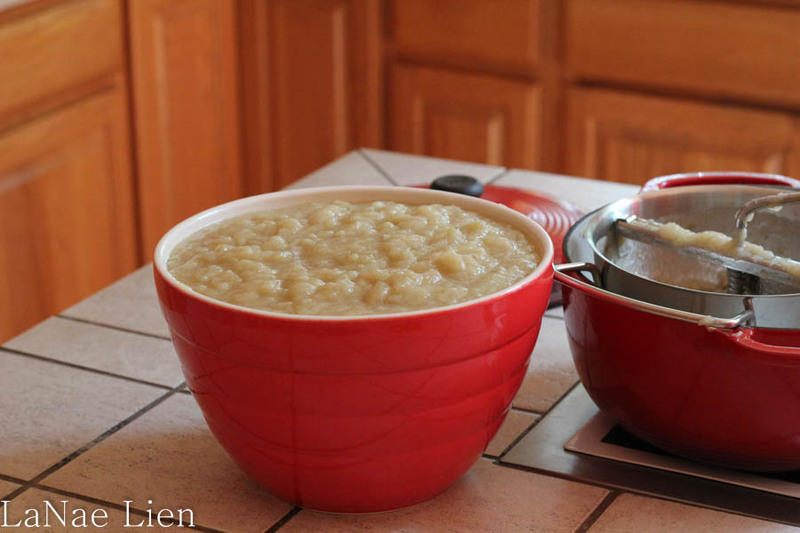 If you don’t have these essentials making applesauce is a daunting task: peeling and coring the apples by hand and mashing them by hand takes time. 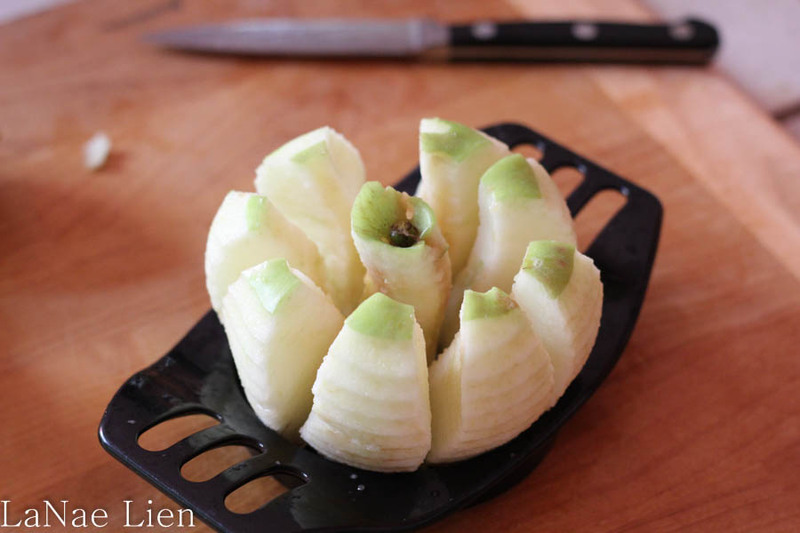 The above tools mean that cooking the apples down take almost as much time as prepping the apples. And, gadgets are fun. 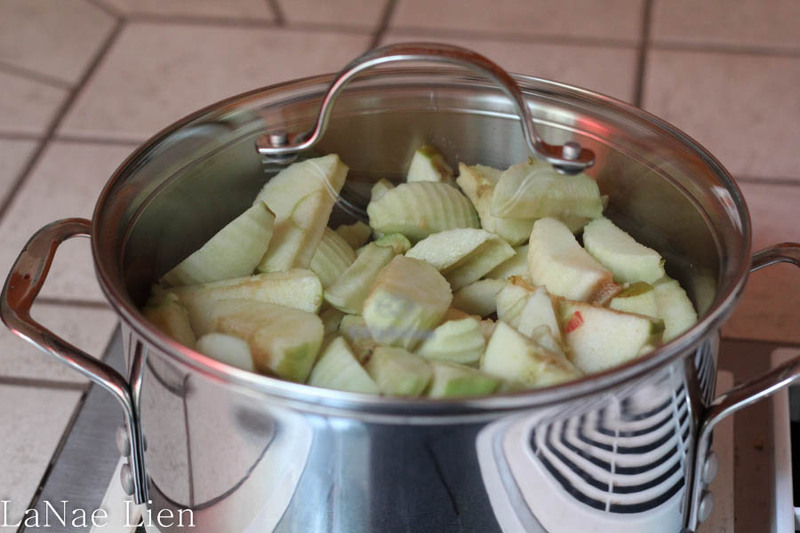 The key to cooking apples for sauce is low and slow. All that I do is put them in a couple of big pots, add a little water and cook them at medium low, stirring occasionally until they’re very soft. I actually turn them down once they are well on their way to reducing. They’re usually on low by the time they’re done cooking. They reduce a lot, so if you’re going to make sauce I recommend buying a full box of apples (or picking what you have on your tree). Otherwise, you may feel ripped off. Our apples came from the tree on our property, which I told you about here. Back to cooking. I use a bit of water in the bottom of the pots, but apple juice works well, too. 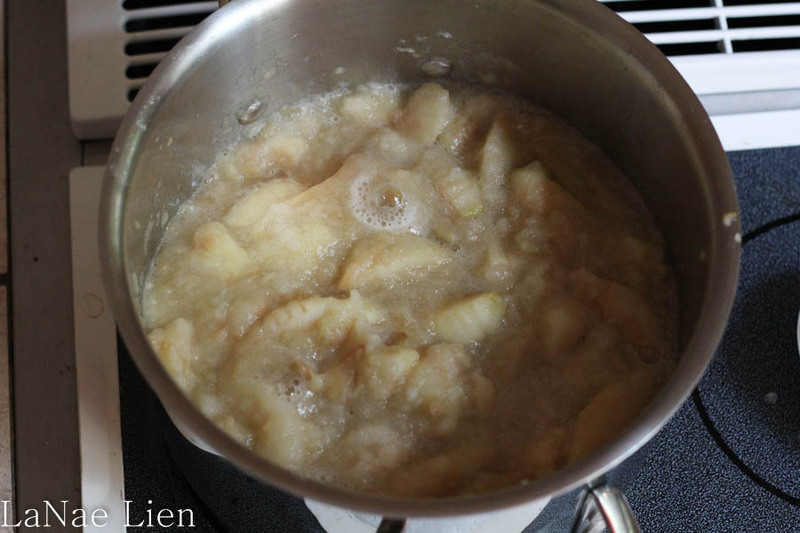 The water is mostly to provide some moisture until the apples start cooking down and releasing juice. It’s important to be patient during the cooking process. If you turn them up too high they will scorch. That’s an unhappy day. I’m not sure how long it takes to cook them down as I don’t time it. Just remember: low-n-slow. After they’ve cooked down run them through the food mill (I don’t wait for them to cool). Add sugar and cinnamon to taste. Now, we have a large standing freezer in my garage, so I choose to freeze my applesauce. 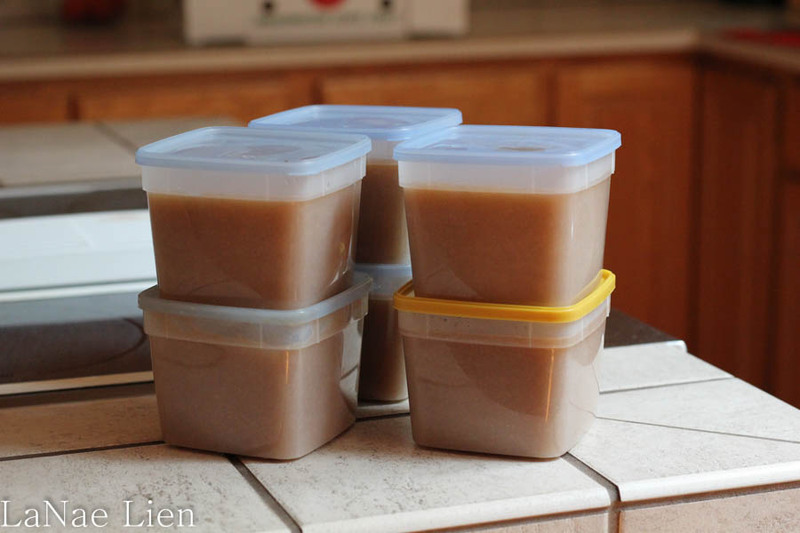 I ladle the sauce into 1 1/2 pint containers and toss it in the freezer. You can also process them in a hot water bath if you don’t have freezer space. Chunky, cooked-down apples before running them through the food mill. That bowl fits 16 cups. That’s a lot of applesauce. Smooooth, creamy applesauce after going through the food mill. Sugar and cinnamon had also been added. There’s nothing like pulling out a carton of fresh-frozen applesauce in the winter, thawing it in the microwave so that it’s a little warm and serving it with a pork chop and a jar of home-canned green beans. Mmmmmmm…. I confess I used to do the whole thing with no gadgets other than a peeler and a knife and spoon…this looks great!